As a part of EMS week CCA is asking our communities to please take the time to recognize the outstanding service your local EMS providers bring to your community. We feel that by participating in both local and nationally recognized EMS events we are helping to bring home the message of the importance of Emergency Medical Services. Erik’s life of service began at a young age when he joined the Boy Scouts. That’s when he developed his passion for helping others, and the first aid lessons he learned at the time inspired him to continue his medical education over the years. Erik holds the honor of being an Eagle Scout. At the age of 16, he became a cadet at his local fire department, and he qualified as an EMT at age 18. 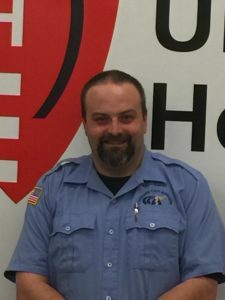 He joined Community Care Ambulance in 2017 as a Paramedic, and Erik has been nominated for his exemplary customer service and documentation skills. Erik has profound respect for the EMS service and a heartfelt desire to help people in his community and beyond. That’s evident in all his daily interactions with patients, customers, and coworkers. When he’s not working, Erik enjoys spending time with his wife and their six children, ages 19, 17, 15, 13, 10, and 6. They love backpacking, fishing, and hunting. Erik also enjoys reading and watching cartoons. When she was just five years old, Trudi and her family came to the United States from Manila when martial law was declared in the Philippines. Trudi studied Art at the Cleveland Institute of Art, and she then spent more than 20 years using her creative talents in the graphics production field. In March 2014, though, Trudi decided she wanted to change to a more fulfilling career—in the EMS industry. 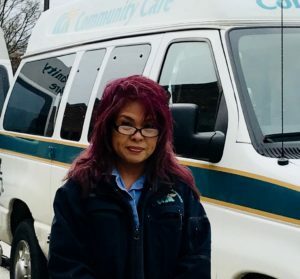 She became a Wheelchair Technician at Community Care Ambulance so she could help people in their time of need. Trudi is nominated for this award in recognition of her dedication and commitment to providing the highest-quality service to each person she meets and helps every day. In her spare time, Trudi enjoys spending time with her family, cooking, and watching movies. She is also known to sing at weddings and was once a lead singer in a Journey cover band.